﻿ Tanegashima Japan - Farming information and ways to garden in a subtropical climate. This is all about my farms on Tanegashima, a small island with a subtropical climate located off the coast of the main island of Kyushu, Japan. Picture - The upper upper farm using a JAXA and NASA space exploration theme. I began farming (gardening) as a child growing up in Kenmore, New York. Our home had a small space behind the garage where my parents let me go crazy growing whatever I wanted. I eventually moved to San Diego, California for college, purchased a home, and was back to gardening in a small space once again. 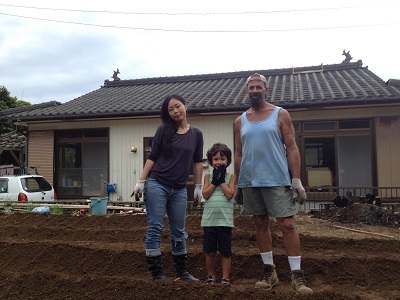 Now I am living in Japan with my wife Akiko and sons, Shai and Lael, and together we are producing some incredibly tasty stuff. These pages contain my thoughts about farming, along with my many farming mistakes and successes, not to mention a ton of good links to real farmers, which I am continuously collecting. Hopefully you find these pages informative, and at the very least, entertaining. Any comments with your, suggestions, constructive criticism, or simply to say hi, are always welcome at the end of every farming page. I am NOT a professional farmer, in fact, a few of the locals were actually laughing at my farms during the first few months on the island. None of them are laughing now. After a year of trial and error, the farms are finally producing, and quite well thank you. Picture - Ready to get into the farming game. Although I did quite a bit of gardening in Buffalo, New York and San Diego, California, nothing compares to the scale (3 farms totaling 400 square meters) I am farming now. A bit of a challenge to be sure but well worth it in the long run. These pages are for those of you out there who are also in the farming learning curve. I am posting my successes along with my many mistakes. Hopefully many of you will post comments on these pages. We can learn from each other and grow incredible things together. Mechanized farm tools - not even a small rototiller. Chemical fertilizers - I am using processed and pelletized chicken manure (really only a little,) but mostly compost and fish pieces. Insecticides - my fingers and feet provide all the tools for getting rid of bugs. Tanegashima, Japan has a crazy climate to say the least. Within the first year on the island, there were five typhoons, three weeks of unprecedented monsoon rains, and four months of strong northerly winds. Definitely not favorable conditions for farming. Through perseverance and a lot of tough work, the farms are producing. 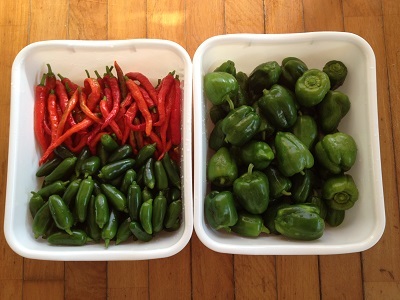 Picture - Harvest of bell, chili, and Jalapeno peppers. My Produce - If at first you don't succeed, try, try again. Pretty much my motto for farming on this island. Learn from my successes and screw ups and please post your thoughts and suggestions to make things easier for me next year. lol. The challenges to farming on this island are many and include: typhoons, strong seasonal winds, monsoon rains, leaf eating birds, and an unbelievably large assortment of bugs. This said, I am determined to continue farming without any mechanization, fertilizer, pesticides, or the purchase of items such as wind barriers, trellises, support poles, etc. The idea is to be self sufficient using materials at hand, including even beach garbage. Picture - An interesting picture of compost materials in the lower farm. Some of my "inventions" worked while others turned into disasters. Check em out and tell me what you think. Peruse All Topics - From farm layouts to using jungle vines on bamboo support poles, this section has it all. An ongoing list of useful and even funny farming ideas.